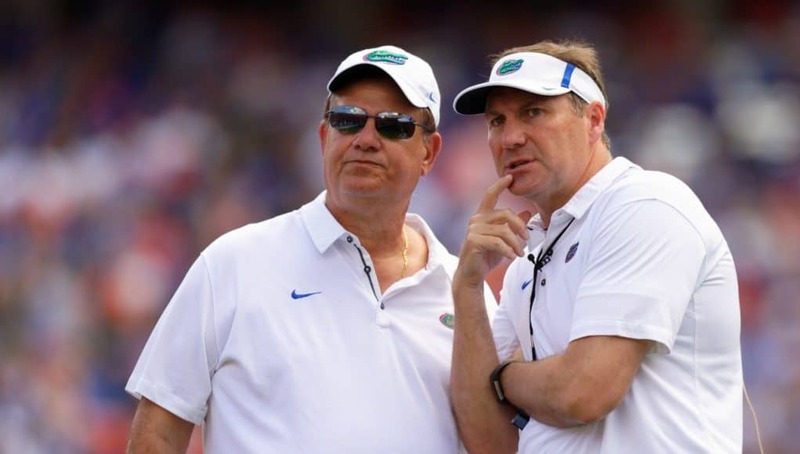 Dan Mullen and his staff are building their offensive scheme beyond the basics right now. Spring was the time to install the foundational concepts; the summer is when the rest takes shape now that he has an idea of what his players’ strengths and weaknesses are. Using the scouting of Mullen’s Mississippi State teams I’ve done this offseason combined with what I know of the roster and things I’ve read about the team, here is what I expect to see from the offense this fall. Jordan Scarlett is an NFL back playing on Saturdays. Malik Davis is elusive and fast. Adarius Lemons is a crease away from a touchdown on every play. Lamical Perine is a hard runner. Iverson Clement is a threat in both the run and pass game. Dameon Pierce is big but also quick in hitting the hole. Florida has an embarrassment of riches at running back, and that’s in stark contrast to the customary question marks in the pass game. There were only two passes. The rest of the early ones used one back to block for the other. The ones from last year added quarterback reads with one back being the carrying option. The other would be a lead blocker either for the first running back or the quarterback depending on the play design. I think we’ll see a mix of those and more, as UF basically has every kind of running back except the Chris Rainey/Jeff Demps type. Feleipe Franks and Kyle Trask aren’t the runner Nick Fitzgerald is, so there will likely be fewer quarterback read plays and a few more passes than what Mullen used in 2017. I can easily imagine Scarlett and Perine with their size and toughness being lead blockers. Davis, Lemons, and Clement are obvious candidates for the plays where one back lines up out wide and motions to the backfield. Pierce probably wouldn’t act as a lead blocker since freshmen running backs tend not to be great at blocking, but we’ll see how he develops. In a break from precedent, Mullen used a lot of two-tight end sets last year because he had four good ones to rotate through. In the same way, he’ll likely employ his six good running backs heavily this year. He often uses a tight end as a lead blocker on runs, but with not a lot proven at that position at UF, I think we’ll see running backs take over some of that work via two-back sets. I have spent an entire other piece on this topic, so I won’t belabor the point here. Long story short, a credible threat of deep passing will prevent defenses crowding the box against the run. What I do have to add since that last article published is that I saw a commitment to throwing long in my breakdown of Mullen’s play calling. Despite Fitzgerald overthrowing almost every deep shot in the game I analyzed, Mullen kept calling for them as part of a balanced offense. Tyrie Cleveland and, if cleared, Van Jefferson should give the Gators a pair of credible true threats this year. “Get it to” plays became a punch line last year: those mythical plays designed to feed the top offensive talents that somehow the coaches just never got around to calling. Mullen has get-it-to plays as well, but he actually does use them. I expect the top beneficiary of these plays to be Kadarius Toney. His speed lets him do the mobile quarterback stuff (minus the throwing) better than Franks or Trask can, and he has the best open field moves to shake defenders. Chad Bumphis was the best slot playmaker Mullen had at MSU. Bumphis’s senior year in 2012 was one of the best for any Bulldog receiver under Mullen, tying for the most receiving touchdowns and ending up third in receiving yards in the Mullen era. Here are some get-it-to plays for Bumphis from that year. Not all are successful thanks to some bad or late throws from Tyler Russell, but you can see what Mullen was doing with Bumphis. The first two have him lined up in a receiver stack, first running a wheel and then a slant. The rest are some quick-hitting plays that are easy to imagine Toney running. The ones in the second half that are more successful look a bit like they have a beefed-up Toney in them with some of the moves on display. Mullen knew he had something good with Bumphis, and he made sure to feed him about as much as he did any receiver in his time in Starkville. I think he’ll do the same with Toney this year. Getting it to Toney was an early emphasis in the spring game, and it’ll probably be the same in the fall. Shortly after his hire, Mullen said he looks for accuracy first in a quarterback. You might think that bodes poorly for Franks’s chances given his 54.6% completion rate last year. There’s a lot more to it than that, though. For one, Mullen showed a preference for experience behind center throughout his time in Starkville. Franks is the only quarterback on the roster to have played. For another, there have been reports this offseason about how Franks is seen as a team leader. Furthermore, Franks is a much better running threat than Trask is. In his three spring game appearances, Trask had to be on the move plenty whether he wanted to be or not. He isn’t afraid of running, but he’s not that fast or dynamic. Meanwhile, Franks showed some good running skills at times last year. Beyond the famous 79-yard run against Texas A&M, he outran the entire Michigan defense on a scramble and pulled it down for a different nice run against A&M. Franks is noticeably faster than Trask is, giving him an explosive potential that his competition just doesn’t have. Mullen knows how important explosive plays are. His Bulldogs had a nice 2017 but could’ve been even better if they had any capability in producing chunk plays. The offense was 21st in efficiency but 125th out of 130 in explosiveness. Franks’s higher ceiling on run potential might be the thing that puts him over the top as starter. It could be that Trask ends up substantially more accurate than Franks and he becomes the primary quarterback with Toney and Emory Jones being the fast runners who take snaps. From the opening drive, however, I think Franks will get the first shot.